Happy Friday!! I can’t believe February is almost over… I’m ready for spring and warmer weather, but not ready for my babies to get older, so I’m trying not to wish time away! We still have so much snow on the ground, but it is supposed to be like 60 out tomorrow! The weather is cray cray! Vest: Forever 21(on sale!) I also like this and this! I’m faux fur obsessed! Earrings: Francesca’s (can’t find mine online), like these! So, I’m kinda hoping this is the last time I wear faux fur… Wishful thinking..we probably have one more good snow coming… Oh well!! I love wearing my Hunter Boots with leggings! My Hunters are probably my favorite shoes! They are so fun and colorful! I’ve mentioned before that I wear them rain or shine all year round! Vest: Altar’d State, mine isn’t online, but I loooove this one! Dress: Von Maur, like this one! Booties: TJ Maxx, these are super cute! Love the fringe on my vest and boots! Definitely a fun way to dress leggings up! Flannel: TJ Maxx, want this one! Leggings and Uggs are my go to cozy look! So easy and cozy! Hat: Target(last year), this is cute! This is my go to look for running errands with the two kiddos! Who doesn’t love a good and cute pair of tennies?! Dress: Loft(last year),like this option! Love me a cozy sweater or sweatshirt dress! I could live in them! I sometimes pair my Uggs with the dress to make the look a little more casual! Photo books and look books are a fun way to show all of your favorite looks in one place! Social Print Studio is a fun and super easy way to put all your pictures together! Check it out!! Happy Hump Day! I haven’t posted in like a week because my little buddy has been sick:( He is finally on the mend… Hopefully…. Let’s just say I’ve been hiding behind hats and sunnies for the past week… Yikes! The pics above we’re taken super quick with my phone, but I wanted to share this outfit with you guys! Black on black is a perfect outfit for a busy mom! I added gray pieces to break it up a bit! Black hides slobber and wrinkles very well, but not spit up! Haha! I love black!! I wear it almost as much as I wear cream! 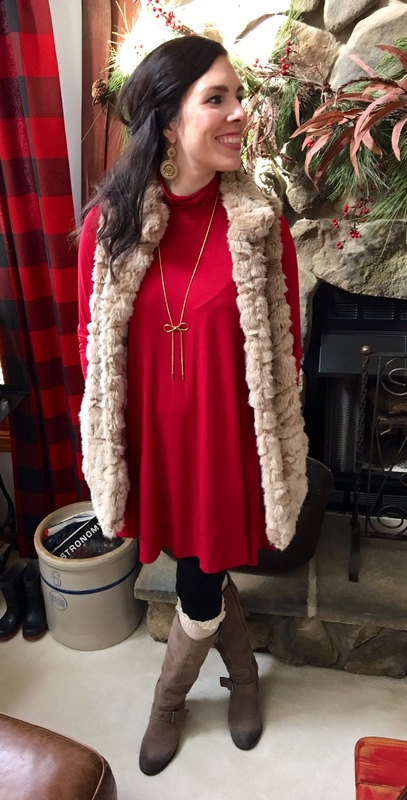 Vest: JCrew Factory( like this too!) Both on sale! Booties: Target(no longer online), like these! Vest: Von Maur(my color is no longer available), love this color and this color! Booties: Forever 21(no longer available) Want these!!! Necklace: Charming Charlie, want this! Happy Wednesday my fabulous readers:) Hope you all are having a great week! It snowed enough yesterday that Miss Libbey was able to be pulled on a sled! She was in heaven! The cutest thing ever! I’ll post a pic on Instagram (amandajune915) later! I hope it snows some more! So, I’m in love with the color of the vest above! I love neutral colors! I’m sure you have noticed:) My exact vest in my color isn’t available, but I linked other colors above and found this one! 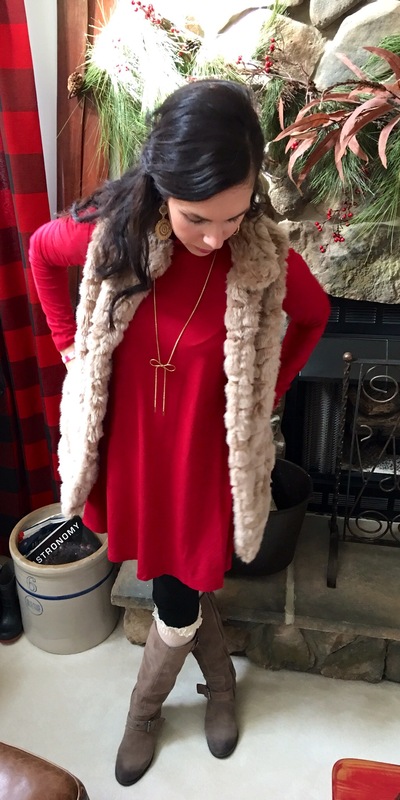 Vest: Von Maur( not available online, this is cute! Turtleneck: Forever 21(old), similar here! Booties: Von Maur, found them here in black!